What size is....?What size is....? The past couple of weeks found me in New York just as Fashion Week was ending and last week in Southern California for a seminar. Perhaps because NY was filled with fashionistas and models, I noticed a lot of very, very thin women in the park and on the street. A jogger along Central Park South could have posed in an anatomy class in lieu of a prepared skeleton. The prevalent look in California, even on the most fashionable streets, is slightly heavier. Fashion models in the 1960’s were about 5’7” (1.7m) and weighed approximately 129 pounds (58.51 kg). Currently average fashion models are two inches taller and weigh about 114 pounds (51.7 kg) according to the wise qeek. The Spanish banned runway models below a certain body mass from the fashion shows in 2006, causing fashion pundits and other journalists to blame the advertising media and the fashion industry for setting up young girls to have low self-esteem that could lead to anorexia. Read more here about the issue.During that same year, the U.S. press announced that the most common dress size in the US had increased to size 14…considered a plus size in many stores. While some are starving themselves, others have given up dieting for good. According to a recent article in the New York Times, the percentage of consumers who are on a diet is lower than at any time since information on dieting was first collected in 1985. At the peak in 1990, 39% of women and 29% of men were dieting. Today, that number has dropped to 26% of women and 16% of men. The movement to eating healthy and organic food has in some ways moved some away from crash dieting. The result is that our concept of beauty also has moved slightly to the heavier side. Dove has co-opted the body image controversy with its “Campaign for Real Beauty” "Campaign for Real Beauty"
What ARE the best size women to cast for lifestyle or business stock photography? It depends. Rarely, if ever, are the extremely thin women that appear in high fashion photographs the best choice to use in lifestyle images for stock photography and increasingly they are unpopular even for that use. For maximum downloads choose women of any age that look healthy, self-confident and energized. Obvious signs of extreme thinness such as visible ribs and overly thin arms and legs should be avoided as well as models that are extremely obese unless you are illustrating a news story on eating disorders. Although size 14 is the most common dress size among American women, remember: advertising is aspirational. The people who aspire to size 14 are those above it. Although the extremes of size from anorexia to obesity are to be avoided, there is increased demand for images of medium weight and plus size women. 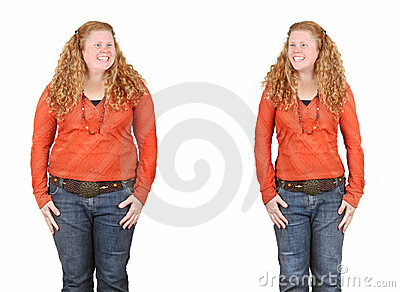 Clothing for plus sized models has increased in popularity. The population is aging. Older women often move into the plus sizes as they age and this generation of older women is demanding stylish ads to sell them on current plus size fashions. The clothing industry has recognized that younger women who may not ever grace the pages of a fashion magazine due to their heft still want to look and feel beautiful and that doesn’t mean a wardrobe consisting exclusively of black muu-muus ( Definition here). Images that feature plus sized women of all ages should highlight their beauty and sense of confidence and in some shots showing them full body in contemporary dress and at work or in lifestyle situations. Avoid always dressing plus-sized models only in black. Group business shots or family shoots should sometimes feature models of many sizes and shapes as well as showing racial diversity. I cringe sometimes when searching on terms like “business team” to find terrific images but with their usefulness constrained by the fact that everyone on the team is the same size/weight and age with only one team member over 40. The most successful business team shots have a variety of sizes, shapes, ages and racial diversity. It’s no news that childhood obesity has become a serious health issue. Because the topic is often in the news, it is a subject that you should consider illustrating. On one hand show an overweight child alone away from a group of other children especially at a pool or at a sporting event to reveal the pain that overweight children suffer. Also show overweight children in a positive light as self-acceptance is a key part of teaching children to live with their body shape and size. Searching on “fat child” revealed a large group of images of candy with no people in the shots. It’s really a leap from a still life of candy to a fat child. Limit keywords to what the image shows. A skinny person was labeled “fat.” Don’t use opposites in keywords. Doing so insults the user. If a user wants an image of a fat person, they will search on “ fat” and become irritated that they have to wade though images of skinny people. Searching on “workout woman” revealed a group of images of workout machines with no people in the image. When my husband is doing errands at my behest, he may think of me as a workout machine but really if there are no people in an image, don’t use people keywords! Photo credits: , Arenacreative, Syda Productions, Fred Goldstein, Ieva Geneviciene, Monkey Business Images, Stephen Coburn, Yuri_arcurs. I think that models have some physical traits, cause they need to show dresses in certain ways. It's obvious then, that the best part of girls are not the same way in weight and height. I'm specialized for example on shoes fahion, and I have to say that thin models are the worst to be photographed for this issue. Anyway, it's a way of work: different images needs different models, and everyone has to know what is worth for his work. I enjoyed your blog. Being one of the size 14s in America, I found it refreshing to know that (while I don't enjoy being a 14) I'm an average American woman. Perhaps now I'll allow some pictures of myself to appear in our portfolio! Stock photos are rearely about fashion, I would think. So it does make sense to use more 'average' size people in our work. What bothers me is the need for 40+ models (age wise). Unless you have some willing friends of that age, most of the available models trend towards more youthful people. Average weight/older people seldom think of themselves as model material. Thanks so much for picking one of my images :) That's my wife, she got a big kick out of seeing herself on the homepage! Great read.